Garrett B. Caffee | Fafinski Mark & Johnson, P.A. Garrett Caffee practices in the Transportation & Logistics, General Corporate & Business, Intellectual Property, and Bankruptcy & Insolvency practice groups where he concentrates in the areas of purchasing, selling, financing, leasing and cross-border transactions of commercial and private transportation assets. Additionally, Garrett assists clients with protecting their intellectual property by managing their trademark and copyright portfolios including registering, maintaining and licensing intellectual property as well as assisting in resolving domain name conflicts. 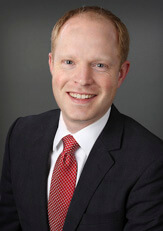 Garrett has significant experience in navigating and negotiating complex commercial disputes. Transactions and business, in general, are his passions; Garrett’s purpose is to help businesses move forward, from inception through disposition. Prior to joining FMJ, Garrett was corporate counsel for a billion-dollar retailer where he led the transactional, commercial litigation, and intellectual property practice groups. Garrett and his three children Montana, Liam, and Madeline spend their free time learning about the world around them. They can often be found camera in-hand and imaginations at the ready at museums and parks.